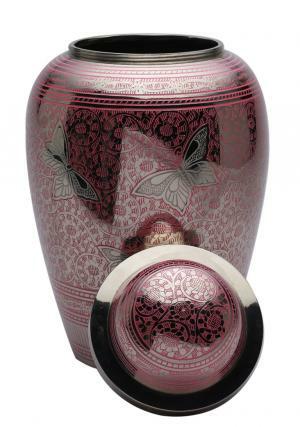 Portland pink butterflies large adult cremation urn has a well polished metallic finish with a reflecting presence on the body. 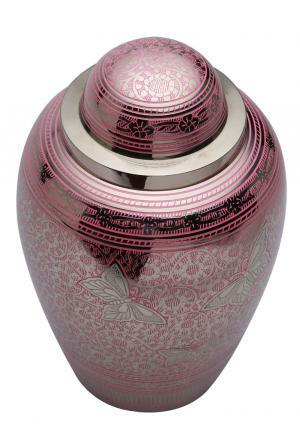 Large adult urn is designed by skilled artisans which represent the quality of design. The urn is a re-creation of blossoming flowers with leaves surrounded and covered towards perfection with beautiful design. The wave texture banded around the urn at the bottom with a ring of floral band decorated on the top. The beauty of art on the urn is represents the quality of work that have been indulged by the engravers. 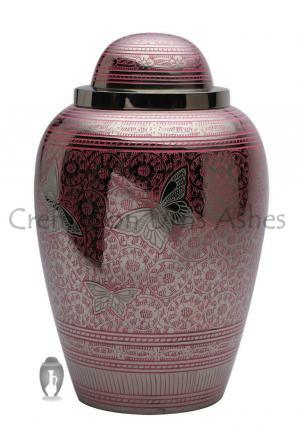 The perfect present to the family, to store the urn with ashes of your loved one. The memorial urn may just carry ashes in it but for the family it is the final journey or tribute to the demised. The butterflies on the funeral urn represents the nature of death and birth as of rise of fallen. The urn has a secured threaded lid on the top to insert ashes and measures to be 11 inches tall. The urn weigh around 2.25 KG and capable of storing human adult ashes into it. 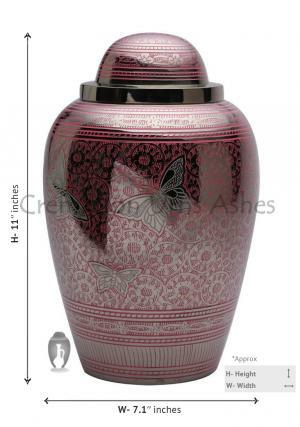 Adult cremation urn is delivered for free within UK and to avail the best offer. Please do not hesitate to call us to the following number to avail best offers and our customer support will guide you to choose a perfect urn.